Good Calories, Bad Calories is written by scientific journalist Gary Taubes who initially outlined his theories about diet and weight loss in a popular article in The New York Times Magazine in 2002. This book took Taubes five years to write and explains in-depth his proposal that what is generally promoted as a healthy diet is actually based on poor science and outdated theories. Good Calories, Bad Calories claims that the public has been misled to believe that dietary fat and cholesterol are the primary causes of weight gain and heart disease. He challenges this belief and puts forward an alternative theory that places the blame for these problems on an increased consumption of refined carbohydrates. Taubes states that it is possible for dieters to gain weight without an excessive intake of calories and declares that too many of the wrong types of calories is the real cause of weight gain. According to him if we concentrate on including good calories in our diet and cutting out the bad calories it will be much easier for us to lose weight as well as to maintain good health. He regards weight issues as being related primarily to an excessive intake of carbohydrates. In basic terms Good calories, Bad Calories regards carbohydrates as the ‘bad’ calories, while fats and proteins are ‘good’. Dieters are advised to particularly avoid refined carbohydrates because they cause an excessive production of insulin, which can make it impossible to lose weight. Contrary to popular opinion Taubes asserts that a calorie of fat is actually less fattening than a calorie of sugar. The diet he recommends for weight loss and heart disease prevention is one that is based on animal proteins and low carbohydrate vegetables and is similar to the Atkins diet. Good Calories, Bad Calories proposes that dietary fat is of little importance in the development of heart disease and he supports his statements with results from a large array of scientific studies. He affirms that the current theory in regard to the relationship between diet and heart disease is not as clear as we have been led to believe and challenges us to question what is currently promoted as being a healthy diet. Lean meat, poultry, fish, eggs, cheese, nuts, avocado, green vegetables, mushrooms, peppers, tomato, grapefruit, melon, berries. Taubes states, “Exercise does not make us lose excess fat; it makes us hungry.” His belief is that exercising can actually make you gain weight because you end up eating more than you normally would. Good Calories, Bad Calories retails at $16.95. Condenses the information of scientific studies so that the results are easy to understand. Will appeal to dieters who don’t want to eliminate high fat foods from their diet. Interesting reading for those who enjoy learning about nutritional research. May assist with the management of blood glucose imbalances. Many healthy foods must be eliminated or dramatically reduced in the diet including fruits, whole grains and legumes. Some of the advice may be overwhelming and confusing to those who are new to dieting. Many of the conclusions reached by the author are not consistent with current concepts about obesity. Discourages exercise as a component of a balanced approach to weight management. The long-term safety of very low carbohydrate diets is questionable. Good Calories, Bad Calories asks readers to evaluate beliefs about what constitutes a health promoting diet and puts forward a compelling argument to support his theories. However many of his conclusions, such as his claim that calorie intake is not relevant for losing weight, are strongly in opposition to modern concepts regarding fat loss. Of particular concern is Taubes’ assertion that exercise can actually have a negative effect for those who wish to lose weight. Even though it is true that exercise can increase appetite, it has a wide range of benefits for health and any potential for an excessive increase in calories can be avoided by selecting appropriate foods. Additionally Good Calories, Bad Calories does not include meal plans or recipes and as such dieters may not find it easy to practically apply the information that is presented. Taubes, G. (2008). 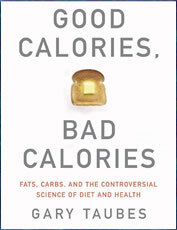 Good calories, bad calories: fats, carbs, and the controversial science of diet and health. Anchor Books. Taubes does not suggest that once you get on the correct diet that exercise is not good for you he only points out that on a high carbohydrate standard American diet is is of no use to make you lose weight or slow your hunger. Maybe you need to read it from cover to cover and UNDERSTAND what you read this time.